“Protecting the Nation from Foreign Terrorist Entry Into the United States” — This presidential order and two others on immigration can be read here. Scholar and student visas are expiring — how can the university help? What is happening with applications from overseas for admission to graduate school in the fall? Can you you give assurance that decisions will be based purely on academic qualifications rather than nationality or religion — so that the current temporary atmosphere will not affect any admission decisions? My fiancée’s May 24 appointment for immigration has been canceled — what can I do? What about students from China — is something going to happen to me? 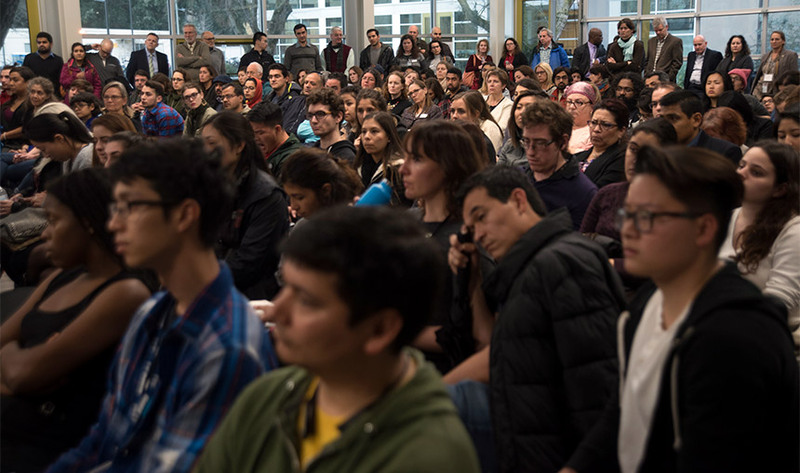 These are examples of concerns raised by international students at “A Conversation About the Executive Order on Immigration,” sponsored by the Office of Global Affairs and held last Thursday afternoon (Feb. 2) at the International Center. The forum drew a standing-room-only crowd, its size estimated at more than 250 people. With an audience comprising more than international students and scholars, Hexter asked: “Why are so many who aren’t directly afflicted by the order experiencing anger and sadness? Part of the answer, I believe, is those feelings are the inevitable products of empathy for those who are — and a belief in the value and dignity of all people, regardless of their background. “Indeed, it’s difficult not to be deeply affected when one considers the plight of refugees, most of them women or children, whose great suffering and hardship has been followed by denial of entry into the United States. I think I’ll add shame to that list of emotions. SISS Director Wesley Young consults after the forum. • UC Undocumented Legal Services Center, which is based at the UC Davis School of Law and serves all UC campuses except Berkeley (which has its own center) — “Our center provides immigration legal services to all UC students who are not international students,” said Rachel Ray, managing attorney. “Our target audience (is) undocumented students, but that does not preclude students who are not international but who are lawful permanent residents or (who are) here through some other method — they can contact us. “And our services are also available to immediate family members of any student, so if you’re a U.S. citizen and you have a parent, a sibling, a child, a spouse or an immediately future spouse, you can contact us and we may be able to provide legal services to that family member.” The center does not help with employment-based visas or employment-based transition to lawful permit residency, Ray said. Joanna Regulska, vice provost and associate chancellor of Global Affairs, commented on all three of the president’s executive orders on immigration, saying they undermine American values and harm the country’s higher education system. “They will deny to many U.S. students the opportunity to learn about different cultures and ideas,” she said. “They do this by limiting their opportunities to engage with international students on our campus and international scholars in the classrooms to learn about different perspectives and experiences.